Identifying a readable address or place-name from a point location is the process of reverse geocoding. Reverse geocoding allows you to discover nearby street addresses; street names; intersections; places; and subdivisions such as neighborhoods, counties, states, or postal codes. You can identify what is closest to a location either interactively by clicking the map or in batch mode with a collection of features. Not only can reverse geocoding help you translate an x,y location to a physical address or place on a map, but the results can also be used as part of additional analysis or tasks. For example, a utility inspector uses their mobile device to collect x,y locations of cable wire boxes in the neighborhood of a new housing development. 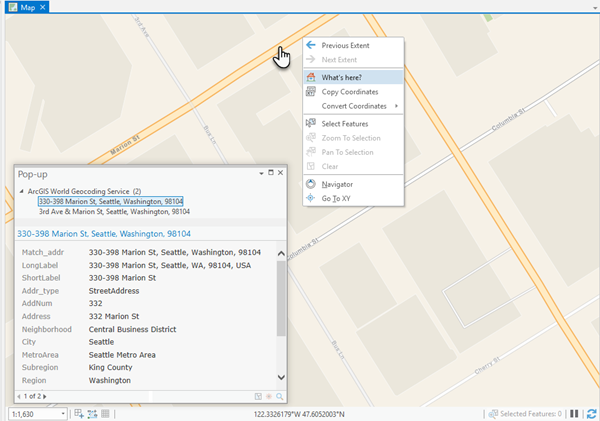 The inspector provides the collection of wire boxes to the field crew, which uses reverse geocoding to get the closest address or intersection of where the boxes are located. Once the addresses are known, crew members can generate a route on their field laptop to get to each of the boxes that need maintenance.